What do writers do when they’re not writing? Ummm , mostly hang out with other writers and attend book-related events. 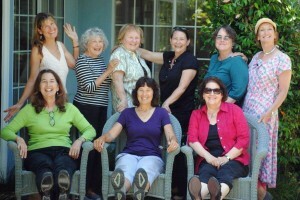 Here’s one group of L.A. Children’s Book Writers that likes to gather together. 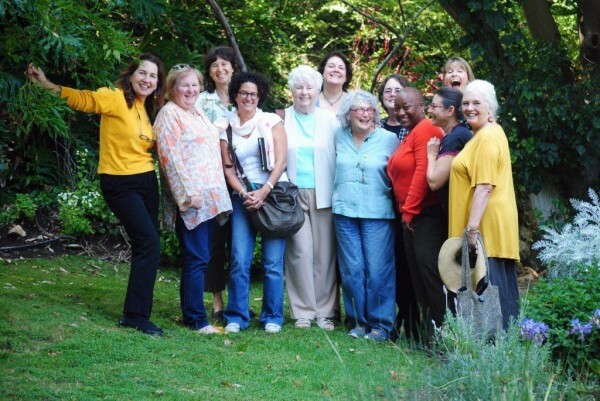 Left to right, Kathryn Hewitt, Lin Oliver, Betsy Rosenthal, Marla Frazee, Eve Bunting, me, Susan Goldman Rubin, Susan Patron, Hope Anita Smith, Amy Goldman Koss (front) April Halprin Wayland, Ann Whitford Paul. Missing (because she’s taking the picture) is Sonya Sones. And Lisa Yee, who couldn’t make it that day. Here we are again – this time Sonya’s in the picture – back row, far right, but Marla and Lisa are missing and Hope’s taking the photo. Hey – where’s Eve? She was there. I’ve also been attending a lot of more formal book-related events spanning the letters of the alphabet. First came the SCIBA Awards (Southern California Independent Booksellers Award) two weeks ago in Long Beach, preceded the night before by a signing at the brand new and gorgeous Mysterious Galaxies bookstore in Redondo Beach. Summer According to Humphrey was nominated but I was pretty sure that The Marbury Lens would win and I was right. What chance does humorous middle grade have against an edgy dystopian YA book, but I had no problem with that. I did have a problem with the glitch that meant there were no books for me to sign. They had a plethora of writers there to sign, including keynote speaker Brian Selznick – a witty and wonderful speech, by the way. The other nominees had books to sign but not me. I was grumpy about it for two whole days. Last week was the CLCSC Fall Gala and 50th Anniversary. Okay, that’s the Council of Children’s Literature for Southern California and was held in South Pasadena. Lois Lowry gave the keynote – how lucky were we? – and I saw a ton of writer and librarian friends, including Denise Doyen, Antoinette Portis (she was also at the SCIBA event), Eve Bunting, Susan Patron, Susan Rubin and Sharon Hearn, who receive a well-deserved honor for her contribution to children’s book in L.A. with her fabulous bookstore, Children’s Book World. I’m doing an event with Sharon this week. But my favorite letters of the alphabet are SCBWI … a fantastic organization that’s a MUST for any aspiring or published children’s book author or illustrator. I have events this week at The Mirman School, Children’s Book World (at Overland Elementary School) …. then comes Thanksgiving, immediately followed by a trip to NY – and that’s immediately followed by 4 days in the Bay Area. Meanwhile, I’m writing Humphrey book 9 (title to come). Back to work! This entry was posted in Awards + Nominations, Friends and Family, School Visits, Uncategorized. You can leave a response, or trackback from your own site. Follow any responses to this entry through the RSS 2.0 feed.